THE LATE MAJOR-GENERAL DAVID B. BIRNEY.—The remains of the gallant and lamented Major-General David B. Birney, who departed this life on Tuesday evening last [October 18, 1864], will be consigned to their final resting place on Friday afternoon [October 21, 1864], from his late residence, No. 1920 Race street. 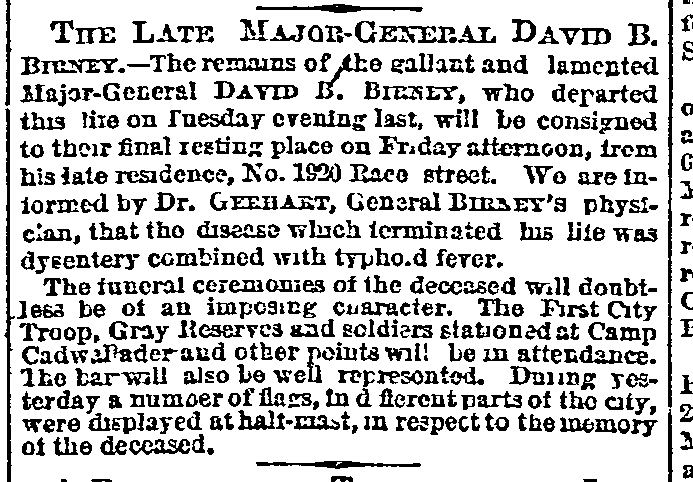 We are informed by DR. GERHART, General BIRNEY’S physician, that the disease which terminated his life was dysentery combined with typhoid fever.